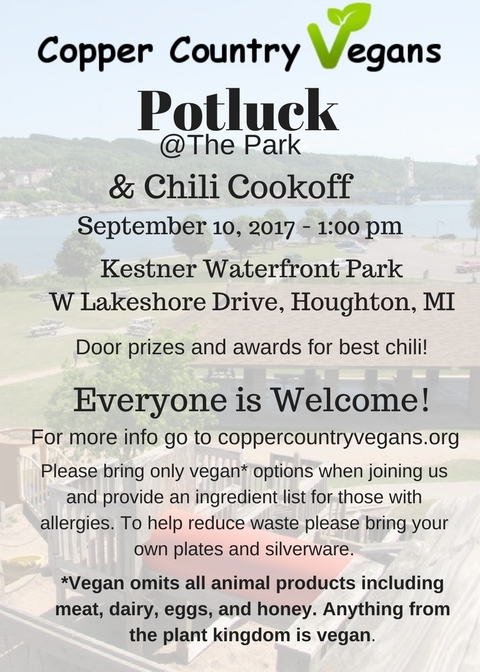 Please join Copper Country Vegans for a potluck at the Kestner Waterfront Park in Houghton on Saturday, September 10th at 1:00pm. As part of the potluck, we will be having a chili cook-off. Bring your favorite vegan chili and see how it compares. We will be awarding prizes for 1st, 2nd and 3rd places. Additionally, there will be door prizes. We ask that you only bring vegan items when joining us and that you provide a list of ingredients for any food dish you wish to share to accommodate those with allergies. Vegan food omits all animal products including meat, dairy, eggs, and honey; anything from the plant kingdom is vegan.